Albert van der Sel : Complex numbers. In the series: Note 9. This note: Note 9: Complex numbers. Please be sure that you are on a "level" at least equivalent to the contents up to, and including, note 8. This note will be a very short note on Complex numbers. 1. Main sets of numbers, and why compex numbers. fractions like 2/7, "floating" numbers with a "." (dot, or comma) like 4.56287, numbers like π (which never end behind the ".") etc.. etc..
Not entirely so, as we will see in a few minutes. But first, let's see what exactly we have right now, and try to classify them. Since a long time ago, mathematicians have classified and labeled "sets" of main types of numbers. fractions like 1/3, 2/7 etc.. and "real" numbers which seems to include about "everything". Here, we have positive numbers only. They can be positive or negative. Q: the set of "fractions" or "Rational numbers", like for example -1/7, 2/3, 8/10, 9/1000 etc..
Don'y forget. Even integers are "Rational numbers", since we can always represent them as a fraction, like 3/3, 10/2, 27/9 etc.. Note: there are a few more sets, but the most important ones are listed above. These are all pretty "normal" numbers. There are many mathematical rules for operating on those numbers. Let 'a' be one of such normal numbers. For example, we never have allowed that a2 is negative. Really! In ordinary calculus or arithmetic, we have always assumed, or required, that a2 ≥ 0. Now, sometimes we need to climb over some fence or barrier, to enter new territory. However, what do you think of the next set: The "Imaginary" numbers? It probably looks strange at first sight. the square of an imaginary number is "negative". 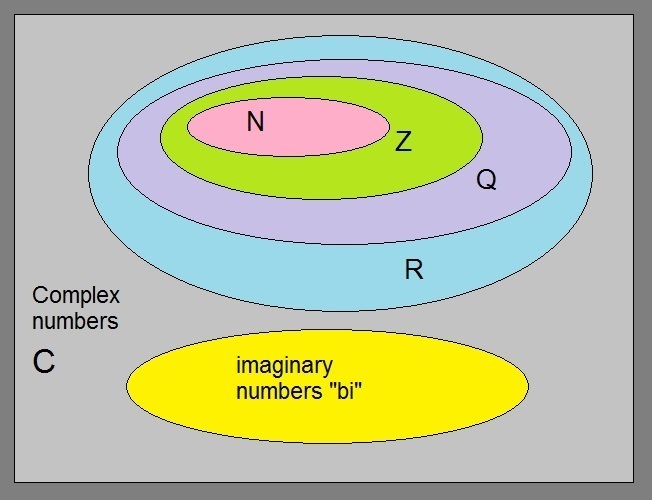 a x a ≥ 0 for any number we know in from N all the way up to R.
But, an "imaginary number" is defined as bi, where i2= -1. Thus we might have the number 3i, and the square of that number is (3i)2 = 32 * i2 = 9 i2 = -9.
in effect, you may say that the square of bi is equal to -b2. Pretty Strange isn't? We will understand it better when we see complex numbers. You should read figure 1 this way: Z encloses N (Z is bigger than N), but Q encloses Z, and R encloses everything. Well everything? No, since the "imaginary numbers" are alien to the "normal" numbers, they are set apart. In figure 1, you see the yellow ellips to illustrate that the are completely seperate from the rest. of numbers: The complex numbers. In figure 1, you see the square. In fact, it is everything inside the whole of figure 1.
then we have nothing new, since a x bi = ci (where axb=c), which is just an imaginary number again. That's nothing new. in all those plots of functions in former notes. and i is that strange object for which holds that i2= -1. The only point both axes intersect, is at (0,0) since then even an imaginary number is '0', if b=0. Do we end up in something familiar? Yes, it all looks pretty much the same as the familiar XY plane we have seen so many times before. Note that iy=yi. Some Folks are just more familiar with writing "z=x+iy" instead of "z=x+yi", but it's the same anyway. The "iy" part, is the imaginary part. Indeed, it's the "i" which makes "iy" rather special. If y=0, then we have z = x + iy = x + i0 = x, which is just a common "real" number. If x=0, then we have z = x + iy = 0 + iy = iy, which is just an imaginary number. z=0 corresponds to (0,0) and that corresponds to "the origin" (O) of the XY coordinate system. than a special case of a complex number (namely, when y=0). Complex numbers have been proved to be a fantastic generalization of numbers. Although complex numbers seem to make things more complex, it's really the other way around ! are greatly simplyfied using complex function theory. In physics, since a long time, it's an essential element in most theories. For example, Quantum Mechanics would not be the same theory without complex numbers. Actually, there would not be such a theory at all. My "focus" here is on "math", but in note 10, we will see some examples from physics. 2. The complex XY plane, and some algebra. In figure 2.1, you see a few complex numbers in a XY coordinate system. For example, note the number z = 2+5i, and for example the number z = -6 -i. You see? It's really easy to plot complex numbers in a XY coordinate system, if you know 'x' and 'y'. Figure 2. Complex numbers represented in a XY coordinate system. then indeed, it looks strikingly similar, but there are some differences. imaginary part of 'z', so that is not evident if you simply express 'z' as "(x,y)". So, usually, it's not done that way, unless it's "handy" for some situation. also note the number 2x-5i. That one is called the complex conjugate of "z". This fact can be important in later notes. The complex conjugate is often written as z with a small "-"
above the letter, or with an asterix as a superscript, like z*. If z=x+yi then it's complex comjugate is z*=x-yi. Note that if z=z*, then it must be a real number, that is, it's on the x-axis, and "yi"=0, thus y=0. In fig. 2.2 you see a picture that illustrates, that "x" and "y" and "r", always form a right angled triangle. Here, the 'x' and 'y' then form 2 sides of that right angled triangle, and the hypotenuse is 'r'. The "length" of r, is the "absolute value" (or it's length, or the distance to "O") of the complex number. 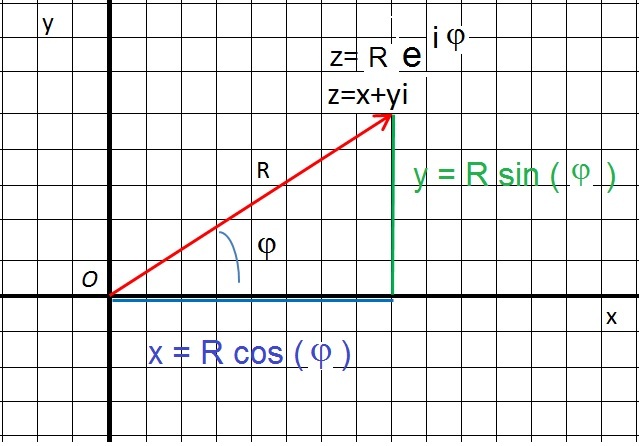 From note 4, we know that x=rcos(α) and y=rsin(α), if "α" is the angle between r and the x-axis. If needed, please check note 4 again, because I think this is very important to understand. From figure 2.2, we know that we may express z in a sum of rsin(α) and rcos(α) too. Having knowledge on how polar coordinates work, may also help to understand "Euler's equation". x- and y-axes. Indeed, you can perfectly "pinpoint" any number "z", by specifying the 'x' and 'y' values of z=x+yi. since I will do it as a "special case" when we have a note on "coordinate transformations". In that note (on "coordinate transformations"), the equation will get clear in a more natural fashion. Here is Euler's equation. You only have take notice of the fact that it exists, and it's often used in many other derivations. z=x+yi (Cartesian coordinates: the real values x and y fully pinpoint the number "z"). fully pinpoint the number "z". z = r cos(φ) + r sin(φ) i (which was shown in section 2.3). Figure 3. Different ways to describe, or pinpoint, "z". Ofcourse, there is much more to say on "complex numbers". However, in my "series of notes", this will do for now. The next note is a quick intro in "differential equations".